Baby-faced John Kucera turned the skiing formbook upside down at the 2009 world championships when he became the first Canadian man to win the prestigious downhill race on a treacherous piste at Val d'Isere in the French Alps. The win is a massive boost for the fast improving Canadian men's team who will have the support of a nation behind them when the Olympic Alpine events take place on the picturesque slopes of Whister Mountain in 2010. Kucera's win was considered by some as somewhat fortunate when he came out of the gate with bib number two and took advantage of clear skies and a slick track to set a time of 2min 07.01sec. He then had to endure a nerve wracking wait at the bottom as the rest of the pack fell short of his mark with one of the race favourites Didier Cuche of Switzerland coming home second just .04secs adrift as the changeable conditions played into Kucera's hands. Cuche, who bemoaned the weather, still paid tribute to the racer from Calgary: "Kucera is no slouch, he's a very technically sound skier and when he has good conditions he's absolutely capable of skiing with the best guys". Born in 1984 in Calgary, site of the 1988 Winter Games, Kucera was inspired by the great 'Crazy Canucks' of the 70's and 80's who were led by Ken Read and Steve Podborski but his list of honours looked thin before his world title breakthrough. 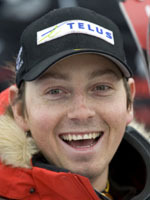 He was Canadian super-G champion in 2004 and made his World Cup debut at Lake Louise the same year. However, he had never been on a World Cup podium until he won the Super-G in November 2006 to also become the first Canadian to win at Lake Louise in the Canadian Rockies, not far from his hometown. The next month, he followed his maiden win with a third place finish in the super-G at Val Gardena and finished the season third in the World Cup standings in that discipline. However his only other World Cup podium was in November 2008 with a second place again in the super-G and not surprisingly back at Lake Louise. He is the son of Czech immigrants and speaks fluent Czech. He has numerous national titles to his name and his excellent all-round ability has given Kucera at least one win in four of the five Alpine disciplines although he has yet to tranfer that to the World Cup circuit on a regular basis. Kucera and all of the Canadian racers known as the 'Crazy Cowboys' will be dreaming of Olympic success in Vancouver where the glory of gold will make them heroes for life. Time will tell if the home racers can live up to the expectations placed on them from not only the home fans but also from the watching millions around the globe.